The Little City Market has been in business for over sixty years and it reminds me of the butcher shops in my hometown back in Germany. 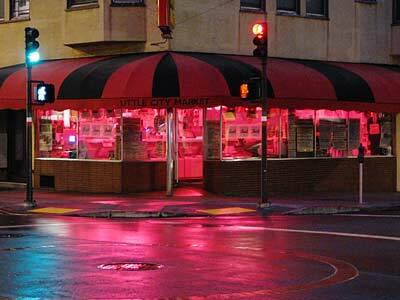 It's a very traditional store and it shows its colors with pride - especially after business hours, when the red glow emanating from its windows lights up Stockton Street. Taken with our Canon S2IS - click the photo for a large version.